Our little walk tonight was rather chilly... it dipped into mid-50s with a brisk breeze. [Earlier in the evening, around 6ish, we had a little "happy hour" at the Academy of Beer, just drinking beer and eating the free bread and wonderful honey mustard. I had been inside all day working so I needed a "happy hour" as I wasn't very happy! The walk itself was rather uneventful -- it was after 9p when we got started and we had to walk to the other side of Lux Gardens to the Notre Dame-Des Champs metro stop to get to the beginning of our little "walking tour" at Rue du Bac. 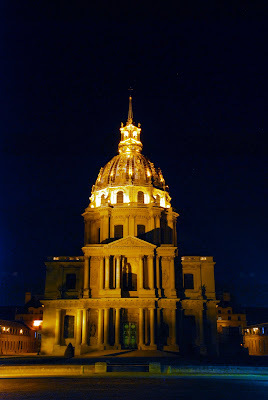 The streets we walked along were largely deserted and shops closed -- except for a nice italian dinner at La Romantica Caffe between the Golden Dome of Les Invalides and the Eiffel Tower. We could see Les Invalides through the trees across the street but the Eiffel Tower was on the other side of the building. 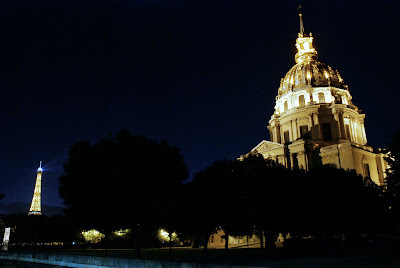 Here are couple pictures of Les Invalides that still don't due justice to just how GOLD the dome really is. After sharing roasted veggies for an appetizer, I had a plain Pasta Bolognese and Amanda had some specialty cheesy (very cheesy) linguini. We kept it inexpensive by skipping the wine and dessert. 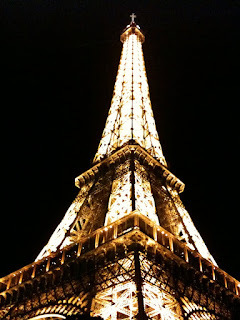 Afterwards, it was already well past 11p, we walked to, and under, the Eiffel Tower. I always forget how darn big that thing is. It really is amazing. It was too cold and we were too tired for me to bother to set up my tripod and try to get a good picture. I have 67 more days to do that! The large grassy expanse east of the tower was full of students who had formed small groups and apparently had a picnic of sorts -- actually, concert tailgating party might be the better comparison! -- on the lawn. Even though it was quite late -- and cool -- a good crowd still lingered. From what I could see, I would hate to be the crew that had to clean up after the mess they were leaving. As we walked along the Quai Branly (that's the name of the road along on the Seine River) to the Bir-Hakeim Metro Station (Line 6) to take us back, it struck midnight. 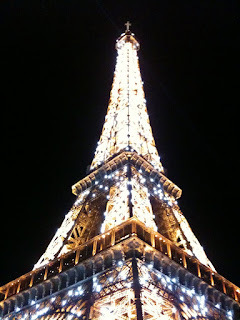 The Eiffel Tower, which is lit up already after dark, does its little sparkle dance for 5 minutes at the top of the hour. And the 30-second movie. Don't you just feel like you were there? Note: I forgot it recorded audio. The initial sounds in the background are the engines of the taxis along the road idling, waiting for riders. Then Amanda told me I was swaying. I said I couldn't help it (although it really isn't that noticeable. She then remarked that you could see the lights all the way up. She didn't realize the whole tower sparkled. After a long day, we were happy to find the subway 1/4 mile away and get home. Yet here I am at 3a posting to my blog. Keep the weather warm. I am packing dresses! Can't wait to meet Julia (At the Beer Academy). Zach would like to know what the drinking age is. See you in a fortnight! It looks like it will be consistently in 50s at night reaching 70s (maybe even 80) in day.